Always dreamed of living on an island? Bathe your skin in a delicate tropical touch and enter your private cabana with Love Beauty and Planet Tropical Hydration Body Wash. This body wash, infused with virgin coconut oil and delicate ylang ylang essential oil, is for skin that needs a nourishing splash of love. This body wash is also 93% Naturally Derived and cruelty-free, paraben-free, silicone-free, sulfate-free, & formulated without phthalates. Read our Naturally Derived Page to find out more. Turn your shower into a revitalizing vacay. Our Tropical Hydration Body Wash is infused with virgin coconut oil, known to nourish, and ylang ylang flower to fill your morning with freshness. • You know the drill, but here it is: Squeeze into hand. Lather on body. Rinse off. • Remember to go easy on the tap. 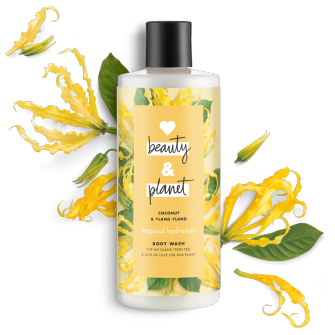 Infused with coconut oil from the Philippines and the scent of ylang ylang flower, Love Beauty and Planet® Tropical Hydration Body Wash gives skin an indulgent boost of hydration that will leave it smooth, while leaving you with an aromatic flourish of fruity floral overtones. Is coconut oil good for your hair? Find out how your hair can benefit from the moisturizing, detangling, and protective properties found in coconut oil! coconut & ylang ylang body wash is rated 4.7 out of 5 by 165. Rated 5 out of 5 by crypticb from I loved this product. The WHOLE idea of the company and product. I love the idea of keeping your carbon footprint small. We need to recycle so badly, I love that these bottles are recycled. It smelled absolutely amazing, as it filled my bathroom with scent. I love coconut oil! I put a light layer of coconut oil on my face after I shower. I have extremely dry skin, and coconut oil and I are friends. I could instantly feel the soothing, and silkening of my skin using the wash.. Great product. I would DEF recommend it to a friend. Especially those are want to take that extra step for the planet. Rated 5 out of 5 by Anonymous from I do not typically leave 5 star reviews, but wow. This product really surprised me. First the packaging really caught my eye and drew me in, after reading the label I was loving the product before I even used it. They are a "no guilt" company, meaning they do there best to leave the tiniest carbon footprint possible. Paraben free, sulfate free, dye free. Next the smell is amazing! The product lathers really well and leaves you feeling fresh and clean. Lastly, it is a drugstore product so it is easily accessible and affordable. I will be buying this product again. Rated 5 out of 5 by samoht from I cannot say enough good things about this body wash. I will start with the packaging and volume. Attractive packaging and you get a lot of it. Then you open it up and the scent is WONDERFUL. So divine! Not too flowery, not overpowering. Very tropical and earthy and it made me so happy to try it! When I was in the hot shower the scent really took off and the body wash is amazingly moisturizing without being greasy. A couple of things that stood out: the texture is very nice and when I put it on my body I had luxurious suds. This won't strip your skin and leave it dry. Rated 5 out of 5 by alemer from I could absolutely picture the Love Beauty And Planet Coconut & Ylang Ylang Body Wash on a shelf in a boutique. 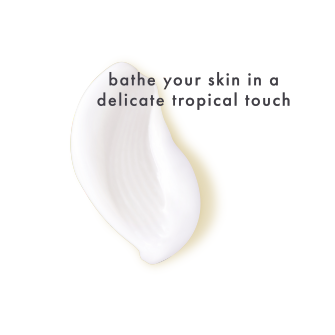 The scent on my skin reminds me of being on a tropical vacation and is very relaxing! I like that it uses mild cleansers so the product isn't harsh on my skin and leaves it feeling moisturized. I also love that a little goes a long way and that this company cares about doing good things for the planet- no animal testing, ethically sourced ingredients, and bottles made from 100% recyed plastic to name a few! Rated 5 out of 5 by Syd2 from Scent Scent is amazing and I love that I don't feel guilty using it because of the 100% recycled plastic, no harmful chemicals etc. Sent this out to friends who are vegan or care about the environment and they're all excited to try it!! Rated 5 out of 5 by winkers from This body wash is The Best I have ever tried. The scent is amazing, just love it. And the way it leaves your skin so soft and smooth, its to dye for. My skin is always so dry in the winter so this couldnt have come at a better time. My skin felt so hydrated and clean. I will be using this from now on. You have a customer for life... the best part is its not tested on animals and it contains NO sulfate cleansers, No parabens, and No dyes! Cant say enough good about this amazing product. Rated 5 out of 5 by jagergrl from The packaging on the bottle is really pretty without being tacky. The bottle lists all of the things that are excluded from the product such as parabens, sulfate, colorants, and silicone. It is vegan, sustainably sourced, organic, and is not tested on animals. The packaging is 100% recyclable. The scent is absolutely lovely! I don't really smell coconut in it, but the delightful ylang-ylang. It takes very little to wash my entire body. It leaves my skin smelling wonderful and soft. Rated 5 out of 5 by Sumlkithot23 from New fave for my shower! I’d nvr heard of this brand, but the name caught my eye, plus I had a coupon, so how could I go wrong? I smelled this and FELL IN LOVE! Now, I’m not one for perfumes, so I steer towards great smelling body washes, lotions, shampoos, etc.....I have GOT to get this whole scent line——STAT! It’s fresh, clean, sweet & girly. It smells amazing! I could go on and on, but I’d rather hop in the shower.......see ya! GET THIS YLANG YLANG WASH!